On January 12, Guatemalan society was shaken with an unpopular revelation. After an exhaustive investigation conducted by 300 investigators from 11 countries, the International Commission against Impunity in Guatemala (known by its Spanish acronym CICIG) announced in a public press conference streamed on its website, that Guatemalan lawyer Rodrigo Rosenberg masterminded his own murder, clearing President Álvaro Colom, who was accused by Rosenberg of being behind the murder in a videotape left and released after his death. In the video, Rosenberg claimed he had all of the evidence to back his claim, but the CICIG investigation did not find any proof. The CICIG explained (.pdf format) that it was Rosenberg who made all of the arrangements that led to his death on May 10. According to CICIG information, Rosenberg contacted relatives to help him hire a hit man to “take care” of someone who was threatening him. However, neither the hit man nor the relatives knew that the person Rosebenberg wanted to be murdered was actually himself. One of the theories for this is that Rosenberg was severely depressed over the death of his mother, an ongoing divorce, and over the murders of one his clients Khalil Musa, and his daughter Marjorie, with whom he had a romantic relationship. He had hoped that the video would cause a wave of reactions that would lead to the investigation in the murders. It is believed that Rosenberg was convinced that the government was behind their murders, but frustrated that nothing had been done about them. The hypothesis is being accepted by the international community, the judge in the case, and most Guatemalans. However, it might seem to be too strange or illogical of a scenario, especially for those who organized a whole movement around Rosenberg and his accusations against the President. 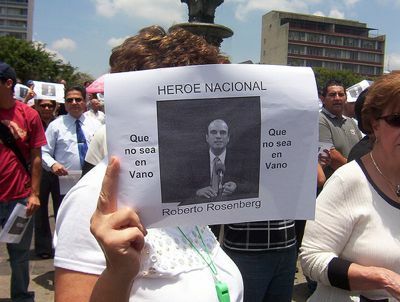 Rosenberg had been considered a martyr of a cause and which polarized Guatemalan society last March, as explained by James Rodríguez of the blog Mi Mundo. Websites like Fuera Colom (Get Out Colom) (now suspended), Facebook groups like Un Joven Más (One More Young Person) which also had a blog , blogs like Renuncie Presidente Colom (President Colom, Resign) and hashtags like #fueracolom were used by hundreds of teenagers and young adults during May and June 2009. Sea o no cierta la teoría propugnada por la CICIG, a mí me parece de lo más increíble. Que este padre de familia, abogado exitoso, haya contratado sicarios para que lo balacearan y así promover un fin político indefinible, es tan inverosímil que no pasaría como trama en una producción de Hollywood. Whether or not the theory advocated by the CICIG is true, it appears to me to be most unbelievable. That this parent, successful lawyer, had hired hitmen to shoot him and lead to an indefinite political end, it is unlikely that it would not even be believable as a plot in a Hollywood production. Luis Figueroa of the blog Carpe Diem [es] still has many unanswered questions about the case, such as ‘who really killed Khalil and Marjorie Musa, and why?’ El Chacal also has many questions [es], such as who ended up being the liar, who came out ahead, and who took advantage of the situation. Impunity is not a left-right thing. Democracy is a virtue that has been strangled out by the ten percent that have ruled Guatemala for centuries. The inequalities of the 1980s persist today, along with the poverty, the violence, incredibly poor race relations and the political instability. The left and right paint themselves as if they were in a quixotic race to freedom with the other standing in the way – yet it is the culture of impunity, of crimes committed by the government of Guatemala that is the problem. In the video, Rosenberg taped before dying he said “we cannot accept the way things are going on and on in this country”. He was right and now he’s dead. Are also suicidal last year’s 6,000 murders reported by official data? We still demand for Justice. Guatemala is a country controlled by organized crime. The President and his family have been named in several other crimes. We just haven’t found any proves or offered enough money to have it shown to all of us. Corruption is not new in Guatemala, just check the timeline: http://report.globalintegrity.org/Guatemala/2008/timeline Serrano, Arzú, Berger and Portillo are not angels or models of virtue and efficiency, as you can read. The struggle for justice is not new either. People like Helen Mack, the parents of Nicholas Blake, Jesús Tecú Osorio, the parents of Anthony Rosales Morales or Hans Castro http://globalvoicesonline.org/2009/03/19/guatemala-a-violin-in-silence-after-murder-of-youth/ demand justice and will like to see the perpetrators prosecuted and in jail. That time line is absolutely mind-boggling! You aré completely right. None of their cases have been solved and maybe won’t ever. What is really sad is That we won’t ever see again a masive response from society as with the story of Rosenberg.